How far can your imagination reach? What do you think is the most expensive shirt in the world made of? I mean what kind of fabric? Hold on your breath as here comes the answer. It is entirely made out of GOLD! Datta Phuge from India has recently purchased one of the costliest shirts in the world. The shirt is made up of 3kg gold and cost him a hefty price of around $250000. He is nicknamed as the ‘gold man’ owing to his obsession for the precious metal. His wrists, neck and knuckles are always borne with heavy bracelets, signet rings and a medallion and you will never find him gold free. Now has added this shirt to his collection which he proudly drapes all over him. He glitters in the light. Phuge always had this dream to be able to wear as much as gold he can and this lavish fashion statement turned his dream into reality. Just as people have different aspirations like they want to own a Mercedes or Audi, Datta on the other hand had this weird dream. He wears this shirt to special occasions like important functions and parties. He is always greeted with mixed reactions. Some are impressed and some feel he is a bit too showy. It took 15 days and 16 people to prepare the shirt. He has employed a security guard to make sure the shirt stays on his back whenever he wears it. Maintaining the comfort quotient was the bigger challenge for the tailors while making the shirt. They came up with a gold cloth sewn in Italian weave for that matter. They also had to make a special machine to sew this shirt. The ancient Indian kings who used to wear suits of armor were the inspiration. The inside has a velvet lining only to prevent scratch. The shirt is heavy and it does clinks. It is not washable and hence needs to be protected against sweat and dirt, something that is of a major concern to a tropical country like India. Datta Phuge says that wearing the shirt makes him feel like an actor and gives him the feeling of success and the proud feeling of being able to fulfill his dreams. He started wearing gold from his college life when he learnt from the society that if those who wear gold are classified as rich. He came from a humble background, started as a property speculator and became a moneylender in Pimpri, based outside Pune. Whenver his company hit on a profit margin, normally in every 6-8 months, he invested in gold. He says that his next target is to make a mobile out of gold followed by golden shoes. The man is happily married to Seema, a government sector employee who also shares the same affinity. She owns 500 kg of gold including gold bags and necklaces. He never fears bankruptcy as he can always sell his shirt then. 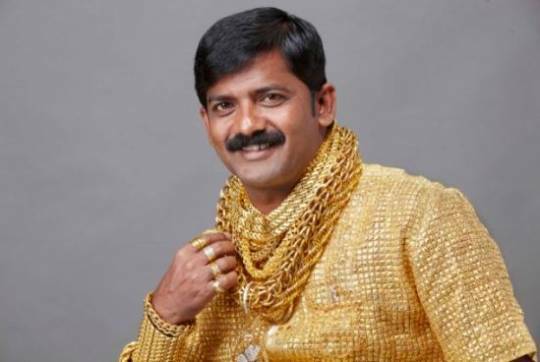 For Indians, gold is a symbol of power and prestige. And so the demand is always on the rise in the market. You will find them investing on gold bars every now and then.